MJ-12: Inception is out today! Today’s the day! 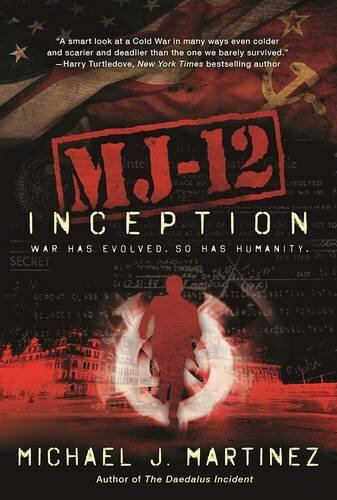 MJ-12: Inception, first of the MAJESTIC-12 series of Cold War spy-fi thrillers, is officially released today in hardcover from the lovely folks at Night Shade Books! I posted the acknowledgements yesterday, but I want to thank everyone involved just one more time for making this book a reality. Hey, let’s take a look at that gorgeous cover one more time, shall we? It’s so very, very pretty. And when I finally get to a bookstore this evening, seeing it on a shelf will make it even prettier. I’ll be staring at it gleefully tonight at Borderlands Books in San Francisco, where I’m doing a reading and signing at 6 p.m. And if you want a signed copy and aren’t in the San Francisco area, let it be known that the good people at Borderlands will be happy to ship one to you. Just give ’em a call. By the time you read this, I’ll be on a plane heading west, so keep your eyes out for various guest posts and such coming out today. If you’re a fan of my work and want to help out, please share on whatever Facechats or Snaptweetgrams you have at your command. It’s all greatly appreciated. And of course, you can now order the book from Amazon, Barnes & Noble, Books-A-Million, Mysterious Galaxy, Borderlands Books, and/or through your local bookstore via Indie Bound. You can also feed your Kindle, Nook, Kobo, Google Play and Apple iBook devices as well. The sad thing is the beer is gone, and I finished the book in to sittings. Now I have to wait a year to plug into the next chapter. Right? It was a very strange time, perfect setting for this one. So glad you enjoyed!